MANILA, Philippines — LET RESULTS. 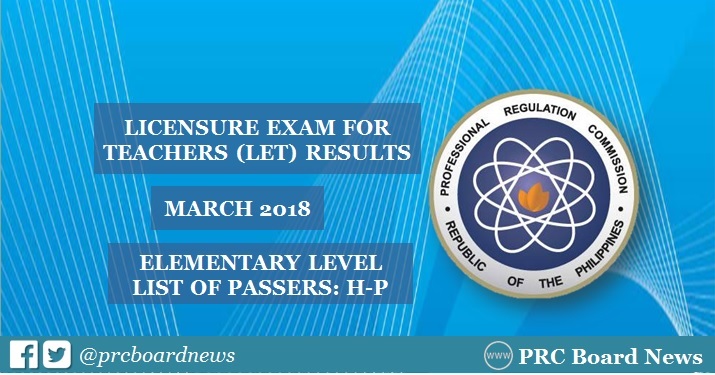 The Professional Regulation Commission (PRC) and the Board of Professional Teachers (BPT) officially released this week the alphabetical list of passers for Elementary Level in the March 2018 Licensure Examination for Teachers (LET) or Teachers board exam. UPDATE: PRC announced that 13,774 elementary teachers out of 58,323 examinees (23.62%) passed the LET. It is further announced that of the 13,774 elementary teacher passers, 4,360 are first timers and 9,414 are repeaters. PRC announced on May 23 (Wednesday) the list of successful examinees for Elementary level who successfully hurdled the exam. The recent LET was conducted in at least 20 testing centers nationwide which include Manila, Bacolod, Baguio, Cagayan De Oro, Catarman, Cebu, Davao, General Santos, Iloilo, Kidapawan, Legazpi, Lucena, Occidental Mindoro, Pagadian, Palawan, Romblon, Rosales, Tacloban, Tuguegarao and Zamboanga. Those awaiting results may check on this page the LET passers with H-P Surnames. The March 2018 licensure examination for teachers is consists of two (2) parts for Elementary: General Education (40%) and Professional Education (60%). Based on PRC Resolution No. 2017-1068, which deals with the 'Schedule of Licensure Examinations for Year 2018, the target release date of March 2018 LET result on Tuesday, May 22, 2018 or in 37 working days after the exam. Source has confirmed that LET result will be released THIS WEEK and hinted May 23 'big day'. "When the sum of the day equals with the month, God will LET DREAM and the DREAMER be ONE." This can be equated to May 23 (2+3=5, 5 is the 5th month of the calendar). PRC Board News will update this page immediately once the results are out online. Check out also the official website of PRC (prc.gov.ph) for more information.